At the biennial trade show, Air Cargo Africa held from 21 to 23 February in Johannesburg a lot of old wine in new skins was presented such as the collective lamenting by carriers about ongoing overcapacity sending yields further south or complaints about the poor infrastructure. A variety of improvements and innovations tabled in Jo’burg contrasted the overall impression, giving the industry some hope for the future. As usual on such occasions and as much applauded highlight, accolades were handed out to participants in different categories. Air Cargo Africa was a lot of déjà vu. Panelist were referring to the “enormous potential” the continent offers, namely due to its fast growing and very young population, the upswing of e-commerce and the fast spreading consumer market. The flip side of the coin is, however, growing poverty in large parts of Africa, particularly the Sahel belt with hundreds of thousands threatened with starvation, insufficient infrastructure, ongoing corruption and a 1999 signed Yamoussoukro Declaration for realizing a single African sky that is still pending completion. Africa is home to about 13 percent of the world’s population but the continent accounts for less than 2 percent of the global air service market. 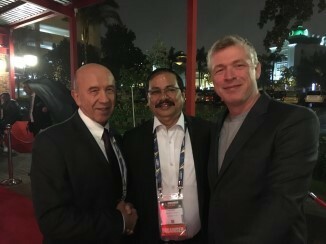 Pictured are TIACA’s Vladimir Zubkov (left), R.K. Patra, STAT Trade Times (center) and Ariaen Zimmerman of Cargo iQ, far right. A major reason for Africa’s underserved status is that a block of countries that have signed the Yamoussoukro Decision declined implementing it. Instead, they restrict their air service markets to protect the share held by their state-owned carriers. Simultaneously, they opened up their skies to Middle East and other non-African airlines that are more efficient in both passenger and freight transport. Consequently, intercontinental African routes are mostly served by foreign operators, hindering the development of an intra-African air network to the detriment of the entire continent. On the occasion, TIACA Chief Vladimir Zubkov strongly urged all Yamoussoukro signatory states to ratify and implement the declaration, giving liberalized air transport within Africa a much-needed push. The state of the African infrastructure was another hot topic standing on the trade show’s agenda. A significant change for the better? 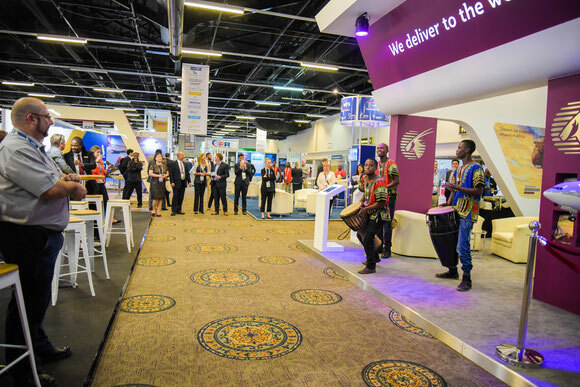 Delegates didn’t table much encouraging news during Air Cargo Africa. This despite the fact that modern and efficient infrastructure is key for economic upswing, income and jobs. One participant from Tanzania pointed out that up to 40 percent of fruits or vegetables harvested are ruined before being loaded aboard a plane. Poor roads, long transport routes, insufficient warehouse conditions and unskilled personnel are the common factors leading to the waste of many goods. Bureaucratic and inadequate customs practices in many African states in combination with corrupt officials complement this sorrowful list. Any new findings by Air Cargo Africa? Not really. Qatar Airways Cargo received the ‘Global Cargo Airline of the Year’ award representing a significant recognition of the Doha-based carrier’s success in the air freight industry. The cargo carrier was nominated and voted the ‘Global Cargo Airline of the Year’ award by STAT Times readers via online voting prior to the awards announcement. Qatar Airways Cargo made the cut with the highest STAT Times reader votes among the top five nominees in this award category. The carrier’s African network has a long-standing history and the company enjoys the continued loyalty and support of forwarders and shippers in this market, reads a CV release. The freight airline is a proven expert in a range of diverse shipments, from perishables, fruit and flowers to heavy machinery for the oil and gas industry on the continent. 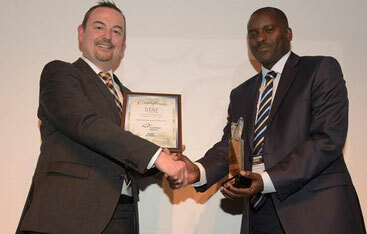 Dirk Schusdziara (left), Fraport Head of Cargo, receives the accolade from Peter Musola, Acting General Manager Cargo, Kenya Airways. Last but not least, STAT Times handed over Frankfurt Airport operator Fraport the ‘International Award for Excellence in Air Cargo’ in the category ‘highly acclaimed’. Last year, Frankfurt was voted the best international freight airport in the framework of "Air Cargo India." 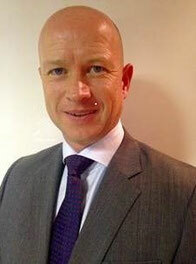 "We are permanently striving to provide our customers with more efficient processes and new solutions. The current award is therefore a new confirmation of the quality of our air freight services,” said Anke Giesen, Executive Board Member Operations at Fraport AG, at the festive reception of the award in South Africa.